I have been absent from posting to the blog! We were in Yellowstone National Park and didn’t have phones or internet. Then we moved on to the Tetons and boondocked so had spotty phone service. Our mileage to Yellowstone from Bozeman was like 90 miles, so it was an easy days drive. 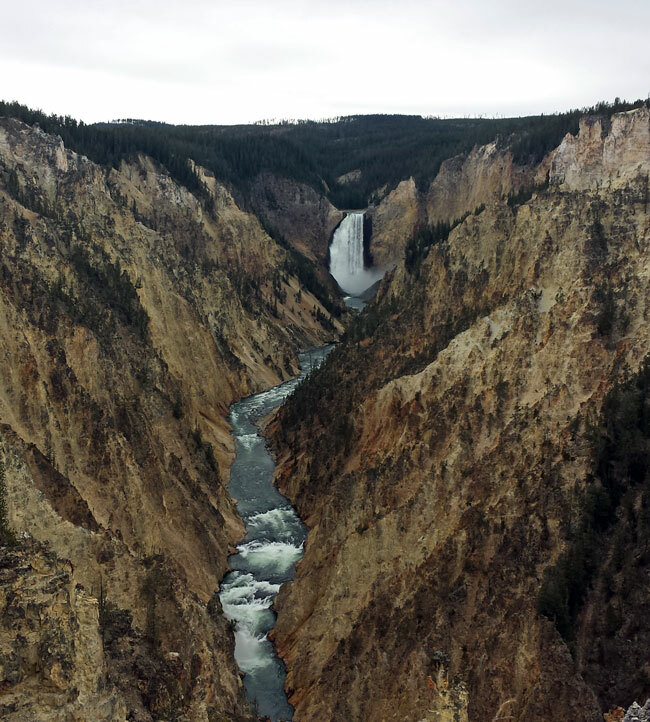 We stopped in W. Yellowstone, MT to check out RV parks and see what the town had to offer. 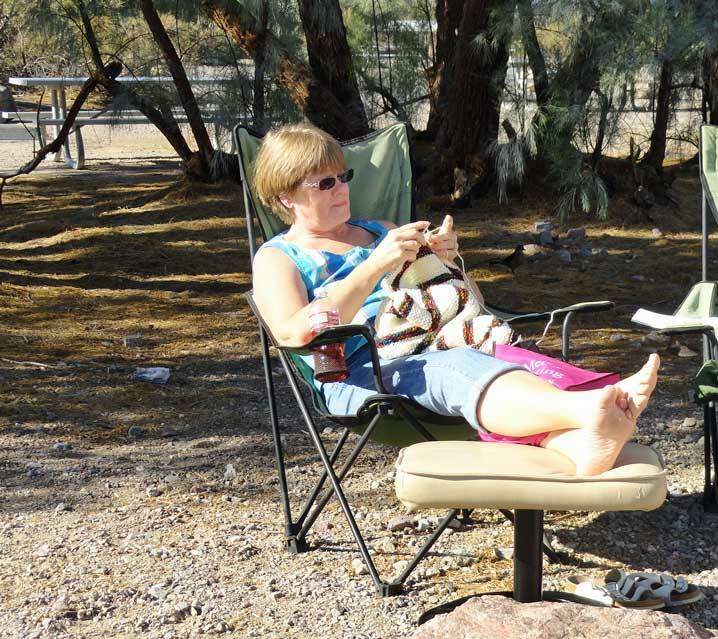 RV parks were $33/day to $45/day full hook-ups. 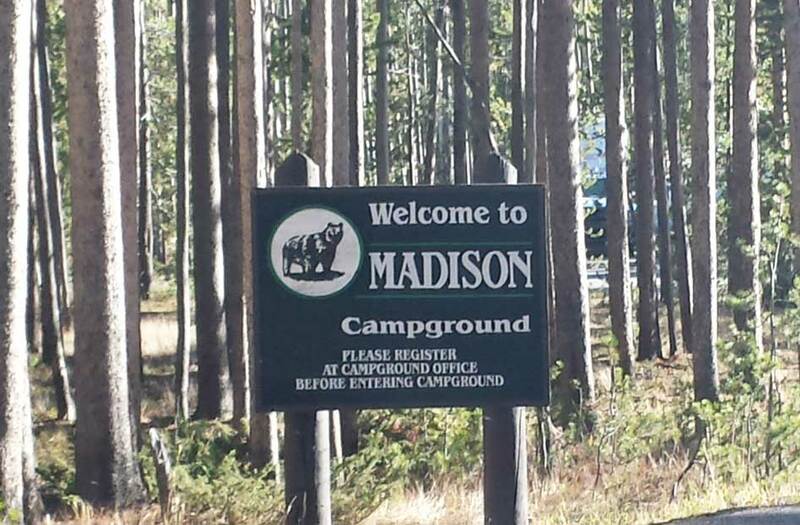 After careful thought, we left the trailer in W. Yellowstone and journeyed into Yellowstone NP to see what the Madison campground had. Not many spots were open but we did find one that we could fit in and get sun so signed up for it. Back to W. Yellowstone to get the rig and grab some lunch. Lunch was a disappointment at the Old Town Café. They couldn’t even cook a decent hamburger and fries. Oh well. Dale went ahead of me to the campground and as I was driving the 45 mph all these cars were stopped on the road. That, as we learned, is “animal spotting.” So I got off on a turnout and found out an elk was busy eating on an island in the river. This is a Bull Elk and had an impressive rack. My phone gave him 2 butts! 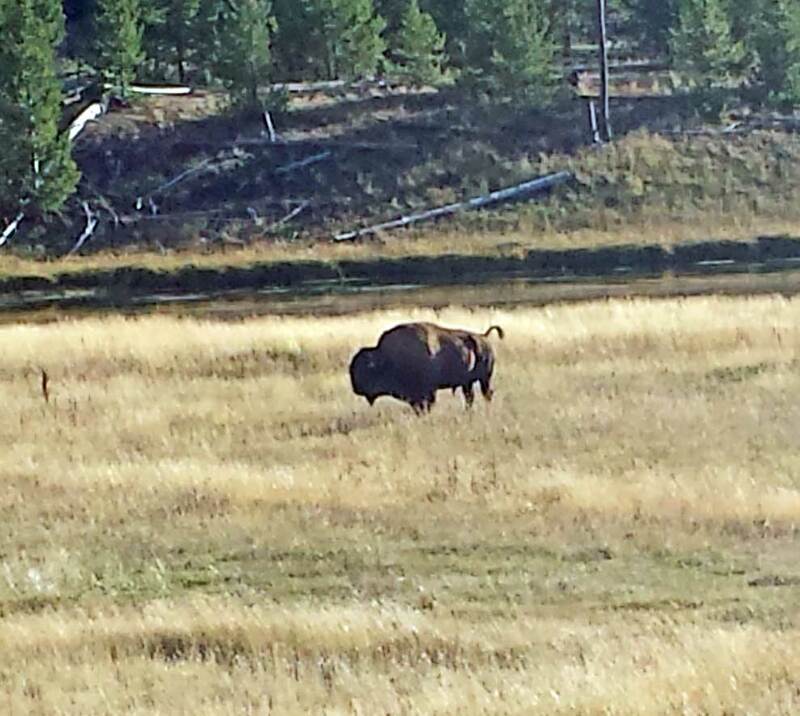 I also saw my first Bison. Our campsite was perfect, except hard to get the TV set up. Too many trees. But that was okay because we were so tired after a day of traveling over the park. We had to put the dog food in the trailer because a momma grizzly and her cub wandered the campground at night. 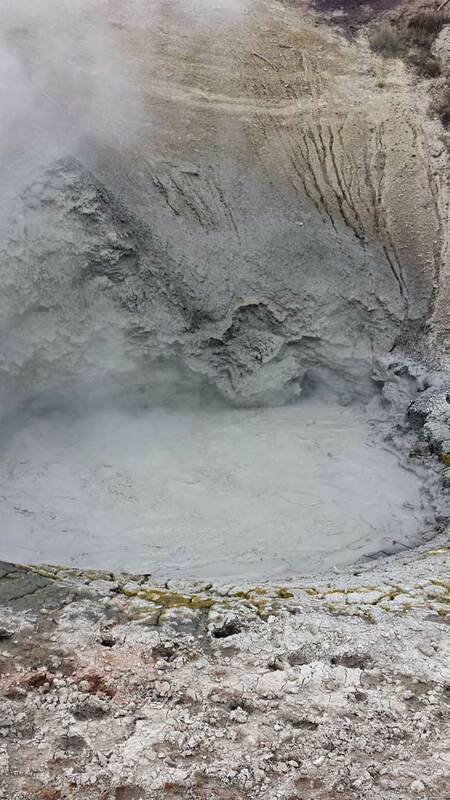 Our first day out included drives off the main road, rivers, waterfalls, mud pots, hot springs, geysers and fumaroles. As you can see here in this photo, dead trees. Vegetation just can’t grow with the very hot water in the thermal areas. We walked many a boardwalk to look at all these. I easily got in my 10,000 steps. Our goal for the day was to see Old Faithful. Being at it is so late in the year to be visiting here, most everything was closed. 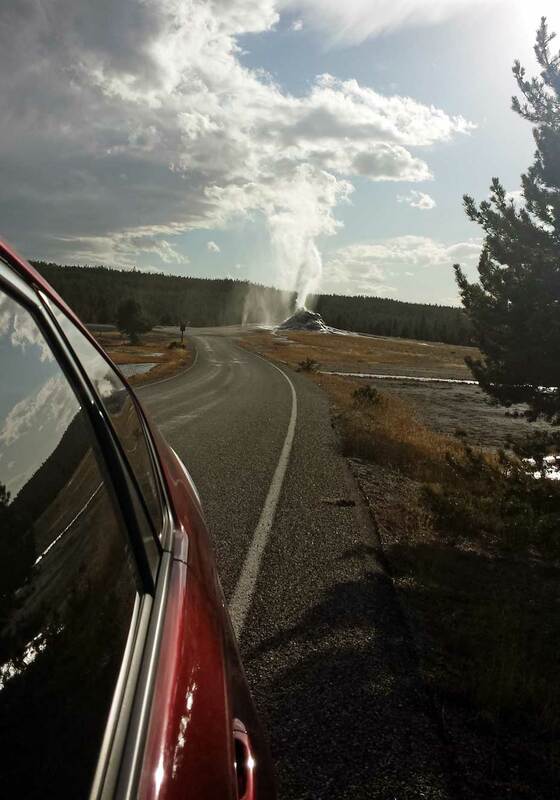 The only buildings open were at Old Faithful. The Visitor Center and Snow Lodge were a gift shop and a grill were open. The lodge had dinners but we were home before then. 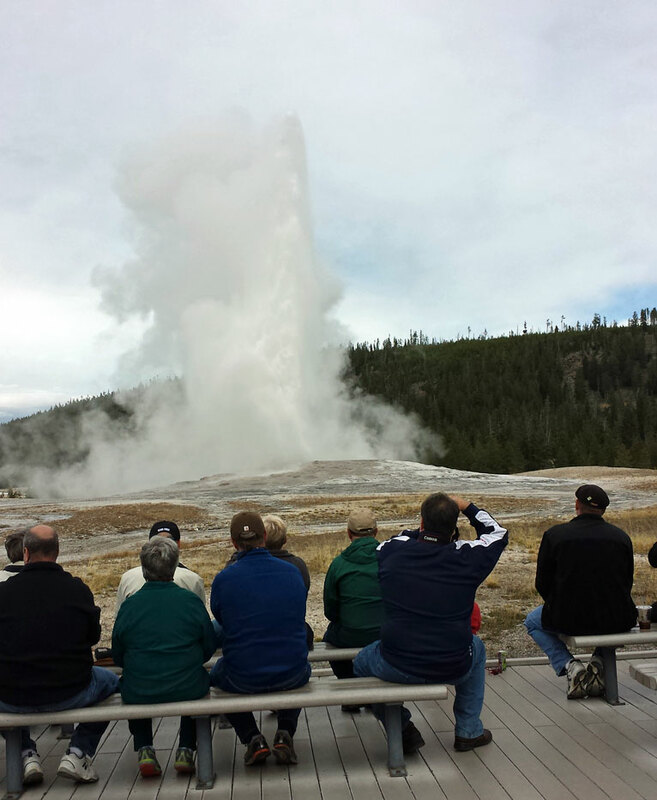 When we got to Old Faithful we had phone service. 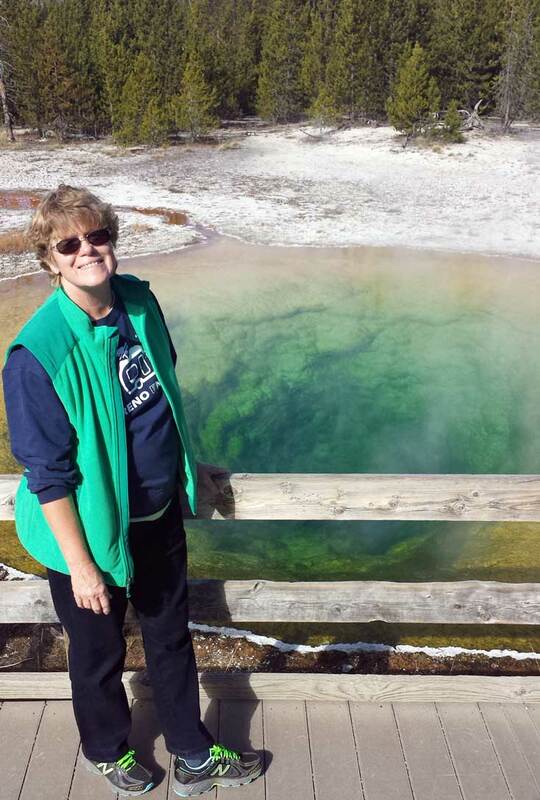 I text by daughter, Lesa, who is in Germany to get on the internet for the web cam at Old Faithful. 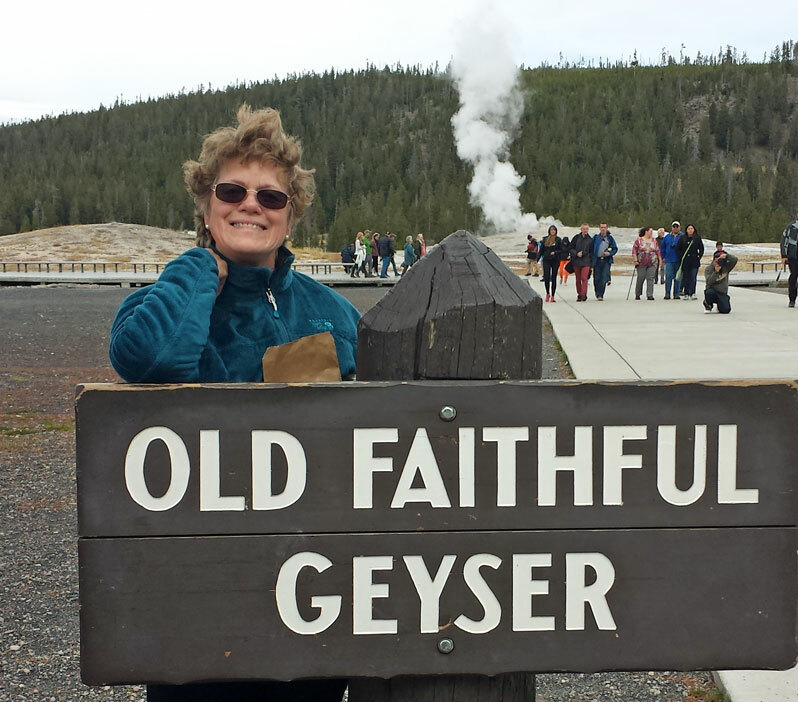 She did and we shared the moment when Old Faithful went off. This made this moment so very special for me. 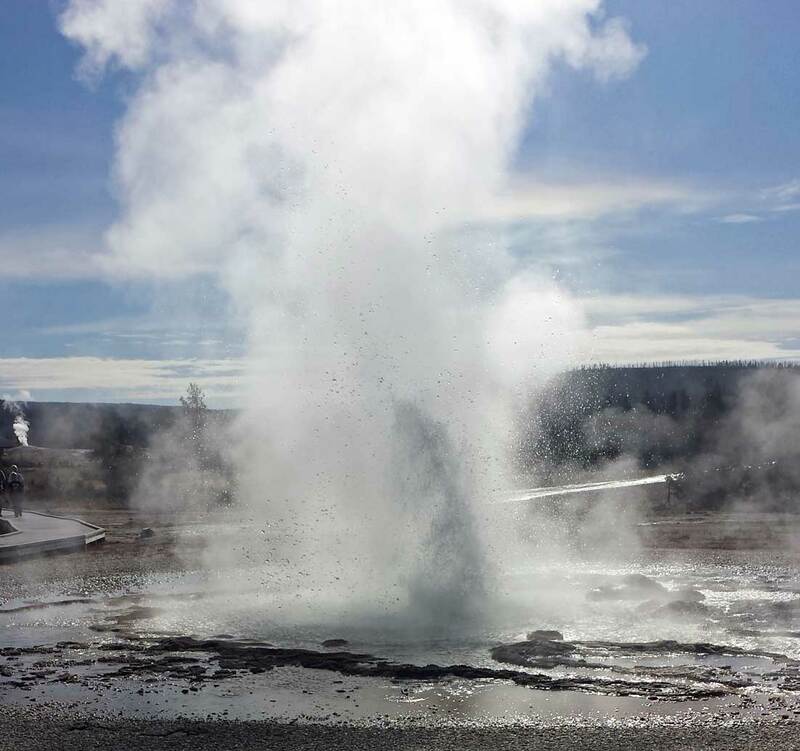 On our way home we took another off-the-road drive and found this geyser. People were around it and we kept driving. However, the thing went off so I stopped to get a photo. 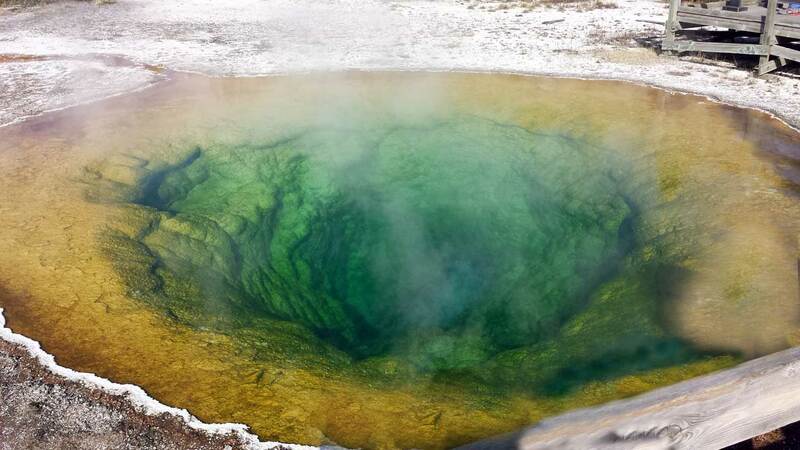 The height of the geyser’s cone tells us its age. Usually 1″ is equal to 100 years. This one was taller than Dale. The next day we went to the East side of Yellowstone. Called the Canyon drive we travelled up and up. Elevation hit about 8000 and we saw some innovative person work. 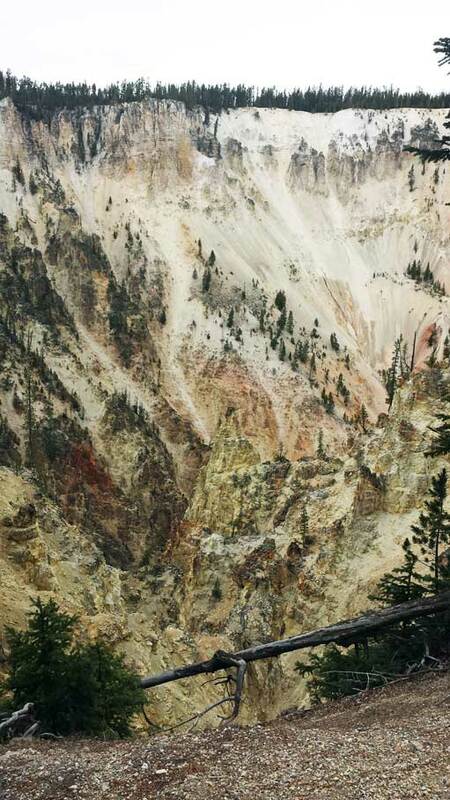 This part of Yellowstone is called the “Grand Canyon” of Yellowstone. Oh my gosh, was it ever beautiful. This is one of the places that “you just had to be there” kind of moments. 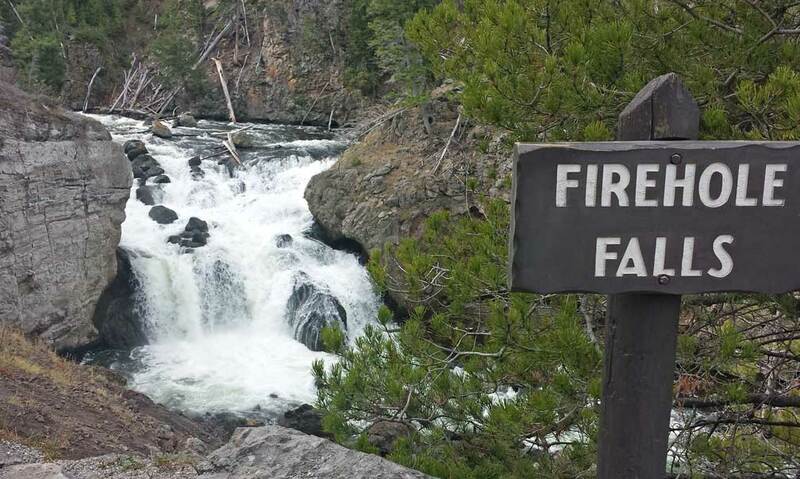 Yellowstone was the first national forest in the United States in 1872. 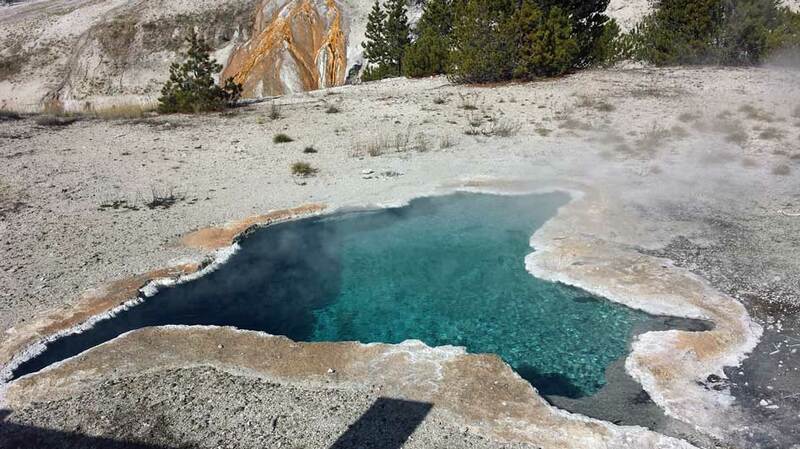 It became a model for other national parks. Aren’t we fortunate this grand place was saved. 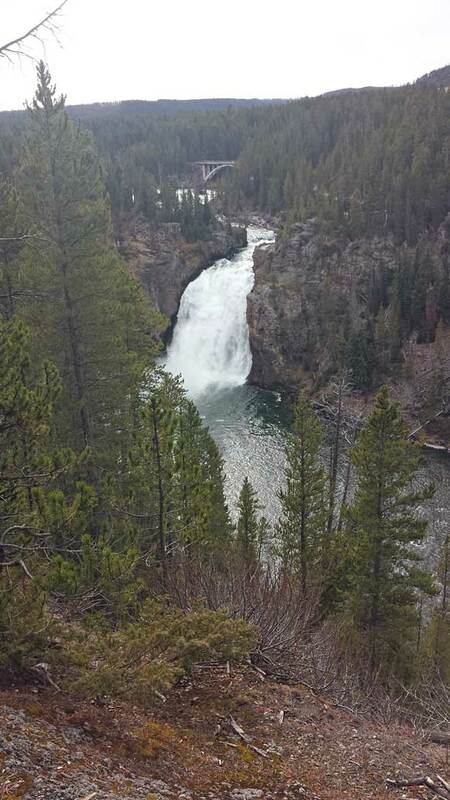 This is the Upper Falls. 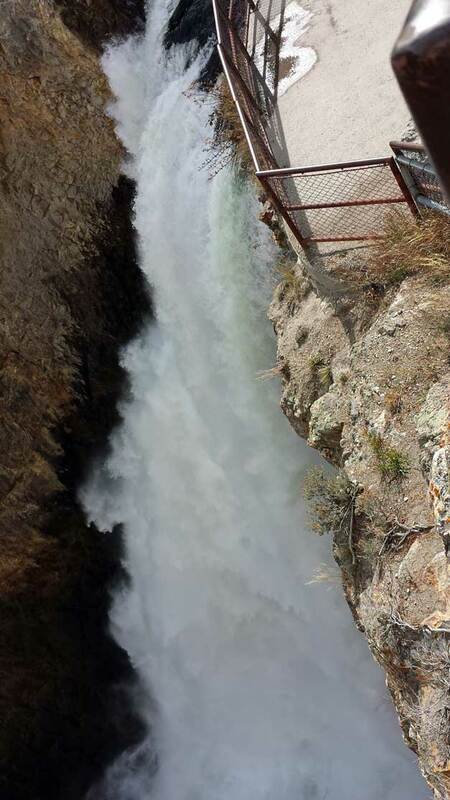 They had hikes to the Brink of the falls which is where the water goes over the falls. I went to both. 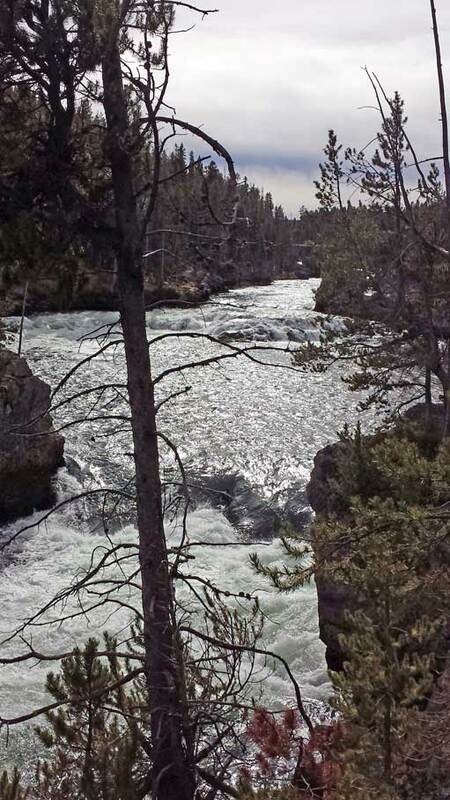 Yellowstone River at the Upper Falls. 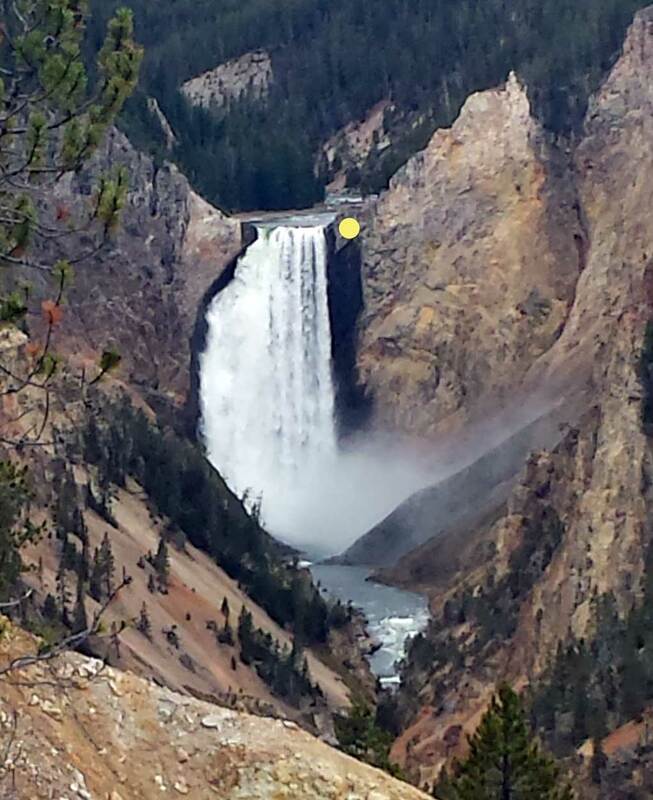 This is the Lower Falls and the yellow dot is where I hike down 600 feet to stand on a platform on the Brink of the Falls. Due to the elevation and the almost straight down walk…I was out of breath. This is the canyon colors and the photo doesn’t do it justice. It was so pretty. We were on the other side of the canyon at the top at Inspiration Point. This is taken from Artist Point. God’s creation here was so incredibly beautiful. 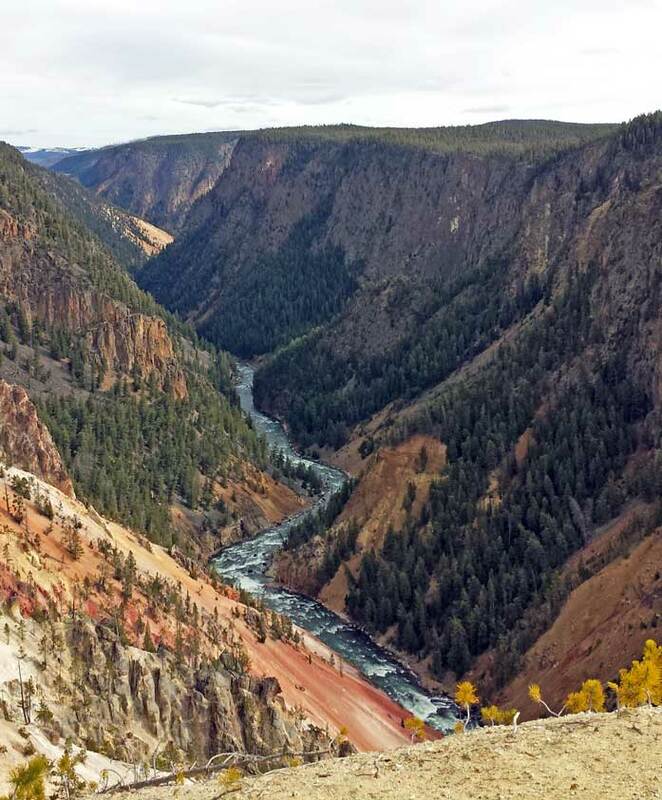 This is the Yellowstone River going east down the canyon. At the Brink of the Lower Falls. 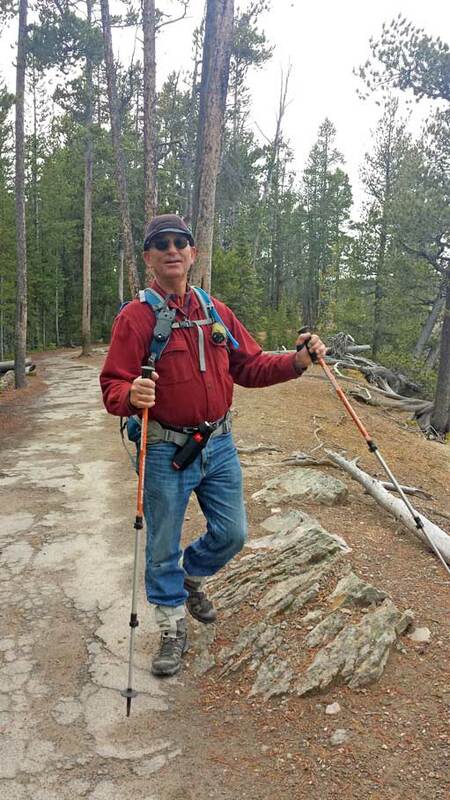 Dale hiked the 5 miles from Inspiration Point to Artists Point. Mostly paved trails. 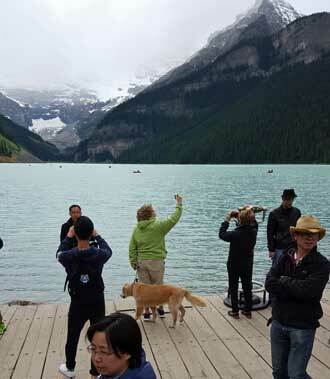 We didn’t understand that other than being handicapped accessible. From here we drove south to some mud pots. On the way back home, we saw a bunch of cars off the road, parked and people out of their vehicles. We learned that this is an indication of “animal sighting” and we stopped. Look what we saw. A grizzly bear was playing in this field. He wasn’t far off the road but paid no attention to everyone. He was just doing his thing! 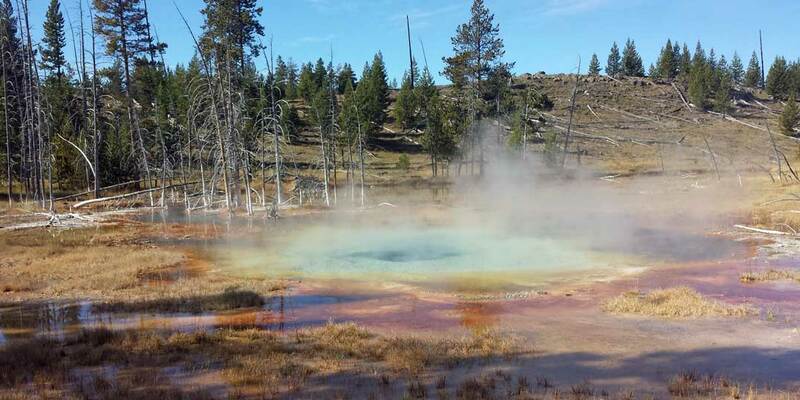 The next day, our last in Yellowstone, took us back to Old Faithful and hiking around behind it to many hot springs, geysers and Morning Glory. A clear warning on the path to Morning Glory. This is the most famous pool. Due to people throwing stuff in it, this has clogged up the springs. 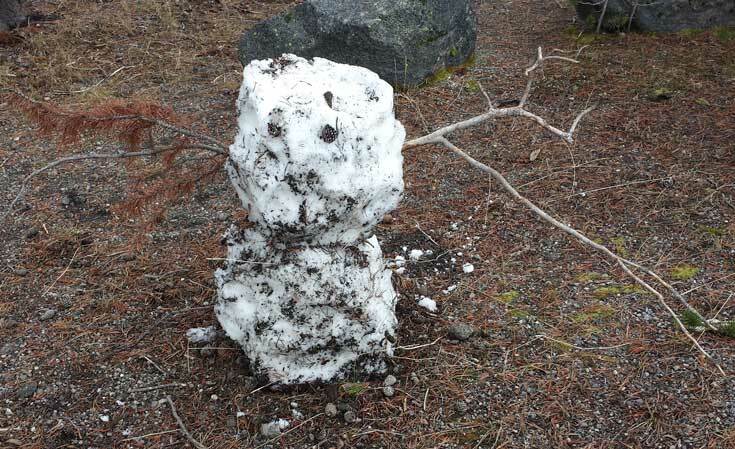 This lowers the temperature and allows other organisms to grow and change the color. I forgot the name of this geyser on the right. It is said that it formed around a tree. 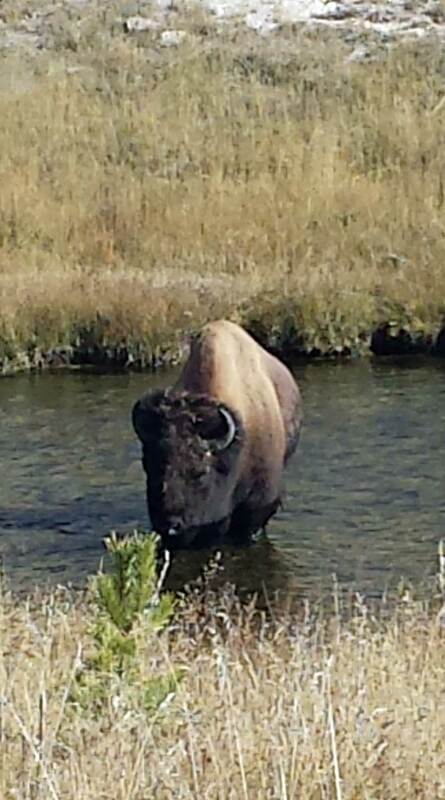 On our way back from Morning Glory we came upon this in Firehole River beside Riverside Geyser. And she/he kept coming. So we boot scooted out of there. After our hike, we hit the grill for lunch. Great burgers and salad. 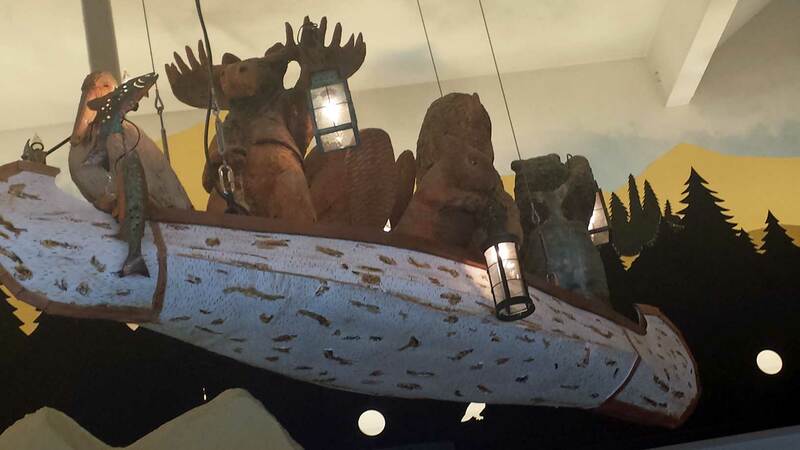 Ceiling decorations. A busy place. It was a great day for us. The sun was out and the day was in the high 60’s. Actually, the weather was excellent. Cold nights and mornings but nice during the day. I enjoyed this adventure and I still have that smile. Life is sooooo good. God’s creation is just breath-taking. 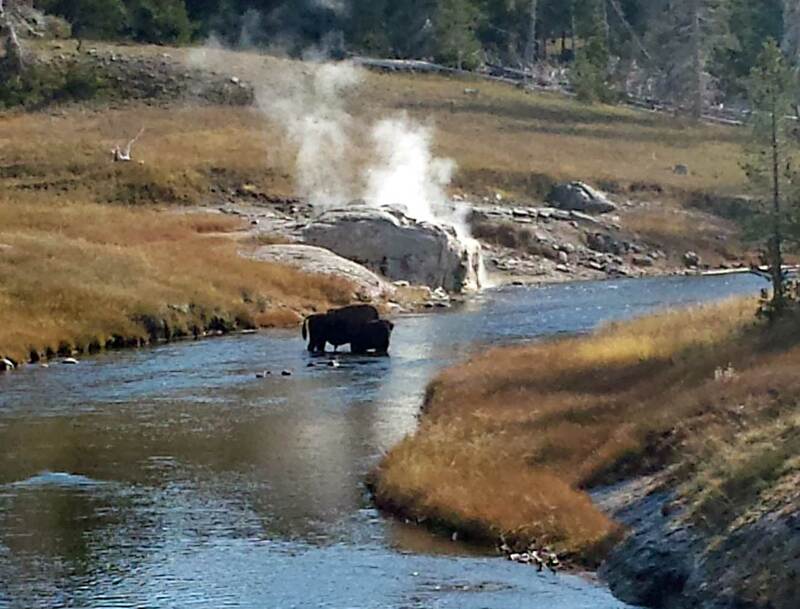 This entry was posted in 2012, 2014, Places to visit and tagged bison, camping, geyser, Yellowstone National park. After my doctor appointment, we got the trailer ready to take a short trip to the Sisters/Bend area. It takes us about 3 hours to get to Suttle Lake in the foothills of the Cascade Mountains. The sun was shining in a blue sky which made for a wonderful drive up the McKenzie River Highway. The scenery on Highway 126 is so lush and beautiful this time of year. We arrived at Suttle Lake in the afternoon and drove through 3 campgrounds until we found a “first come, first serve” campsite in the Link Creek C.G. We found a semi-secluded site, in the partial sun just on the edge of the lake. If you know Morgan, she headed right for a good swim! Our camp was worth the $8 a night. Garbage and water provided. Even though the clouds and rain came, we had a good time touring the back roads and little lakes to the south of Suttle Lake. 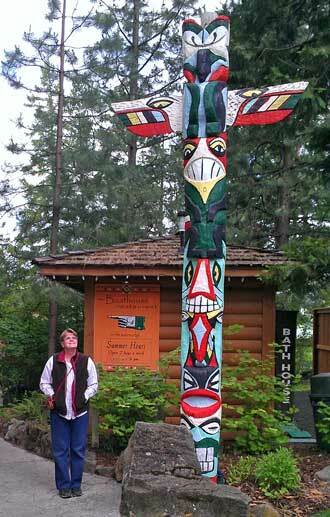 We had breakfast at the Suttle Lake Lodge one morning. It is awful, being a ex-line cook, and knowing some tricks of the trade and then critiquing the meal. We were not impressed with their $13 flat omelet and frozen potatoes. We did, however, have a very “up” and friendly waitress that made for a good experience. We enjoyed our stay and touring. 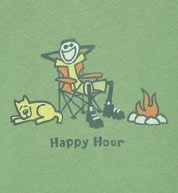 But time to go find some dispersed camping and give our solar a good workout! Life is good. God’s promises are real! 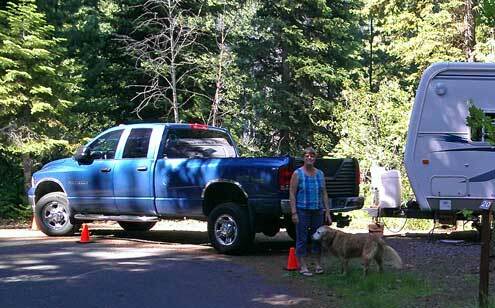 This entry was posted in 2012 and tagged Bend, camping, dispersed, Sisters, Suttle Lake.